Context: The Health System Development Plan is one of the key steps taken by the eleventh government to promote health services in the country. Aims: The aim of this study was to determine the relationship between the quality of nursing care and the satisfaction of pregnant mothers from the implementation of the health system development plan. Settings and Design: This research was an analytic cross-sectional study. The study population included 163 mothers who were hospitalized before delivery and 18 nurses from maternity sections who were selected by the census method during the 3 months of September 2017–November 2017. Material and Methods: The data collection tool was a demographic data form, quality patient care scale, and a researcher-made questionnaire on the satisfaction of hospitalized mothers in maternity sections of the implementation of the Health System Reform Plan. Statistical Analysis Used: Data were analyzed using descriptive statistics, Mann–Whitney test, and correlation coefficient in SPSS-16 software. Results: The results showed that the quality of care in nurses at the desired level (63%) and the satisfaction of mother maternity sections of the delivery system had a moderate level of implementation of the Health System Development Plan (56.3%). The results of Pearson's correlation test showed that there is a statistically significant relationship between the quality of nursing care and patient satisfaction (P = 0.001). Conclusions: The satisfaction of the mothers participating in the research was that the quality of nursing care was often modest after implementing the Health System Reform Plan. The issue of health is one of the most important criteria for measuring the performance and attention of governments in the social sphere, which has a special place. The availability of health-related services is important for people; however, the problems in the society, such as high cost of treatment, make it difficult for the various sections of society (especially at risk and disadvantaged groups) to receive such services., Today, most countries in the world that have a favorable status regarding the development level have achieved universal health coverage. In fact, public health coverage is one of the most important social reforms in the 21st Century. The need for reform in all service organizations, including the health system, is inevitable. Therefore, according to the experiences of other developed countries on public health coverage and with the start of the eleventh government, the Ministry of Health, Medical Education and Healthcare has developed the Health Development Plan (HSEP) in accordance with the 5th National Health Development Strategy 2011–2016 aimed at reducing health-care costs and promoting and increasing access to health services., The national plan has been designed in the form of various interventions and packages that have already been implemented in three stages. The first phase of the project began on May 15, 2014 in state-owned hospitals across the country, which included eight packages of services (reducing hospitalization rates, supporting the survival of doctors in deprived areas, the presence of doctors resident in government hospitals over 64 beds sleep, improving hotel accommodation quality in government hospitals, improving the quality of public health services, the program of natural childbirth, the financial protection program for patients with severe illness, special needs, and the establishment of an emergency airway).,, The second phase of the Healthcare Reform Plan, with emphasis on primary health care, commenced in early June 2014 and its third phase from early November 2014 with the aim of eliminating out of payments and equity in the remuneration of specialized medical services. The implementation of this project in health-care centers has always led to various criticisms and support. One of the main goals of this plan is to reduce the cost of treatment from pockets of people, which was emphasized by the fourth development plan on its reduction; however, its implementation was forgotten. In general, the main goal of the health system development plan is the satisfaction of the people (including the vulnerable and deprived of society) of providing and improving the quality of health services in a completely equal manner., Satisfaction is a complex set of different measures that, to achieve this, it is necessary to achieve a complete harmonization of the various aspects of the health services provider and in compliance with the rights of the client, to provide the necessary conditions for the provision of the services. In other words, from the health system, satisfaction means the need to address the needs and problems of patients is the goal of achieving health goals. Hence, satisfaction with desirable services is considered as one of the indicators of quality health care in health centers in all countries of the world. The client is the main focus of the hospital and all of the hospital services are performed for him, and his satisfaction is partly indicative of a satisfactory service delivery, and this satisfaction is obtained from the behavior of the hospital staff. In this regard, the satisfaction of pregnant mothers with received health care can be considered as an important indicator for assessing the quality of health care provided. If mothers' satisfaction from delivery leads to positive thinking and increased self-esteem, maternal expectations of subsequent childbirths and subsequent care provide a satisfactory equilibrium. Accordingly, finding the aspects of the service that leads to patient satisfaction and dissatisfaction and trying to promote and eliminate them can be the most effective and least costly way to provide the desired services. Despite the short shelf life of a Health System Development Plan, studies have shown that there is a relationship between the satisfaction of clients and their implementation. Furthermore, the results of Hashemi et al. indicated that satisfaction rate of hospitalized patients from the provided services was favorable to the development of the health system. Quality attention and efforts to improve the quality and evaluation of health and nursing care have always been considered. The quality is an important indicator for achieving effective and cost-effective health services. In this regard, the satisfaction of the patient with nursing care is considered as an important indicator of the quality and effectiveness of the health-care system. Patient satisfaction with the care they provide is one of the most important ways of measuring the quality of clinical and executive care provided to them. Given that nurses provide the highest level of care in relation to patient treatment, they have a significant role in improving the quality of nursing care. Patients are entitled to good nursing care of good quality. However, according to research conducted on the quality of nursing and patient satisfaction, we find that despite this much effort in this field, we have not yet achieved this goal. For example, the study by Gholjeh et al. showed that the quality of nursing services was moderate. Quality of care abroad has also been reported low; hence, the results of a 2012 study showed poor quality nursing care and patient satisfaction in countries such as Ireland and Greece. In general, the Health System Development Plan, such as other plans, needs to be reviewed to identify shortcomings. On the other hand, identifying the level of satisfaction or dissatisfaction with this plan can clarify the process of implementation of the Health System Development Plan because with the knowledge of the weaknesses and strengths, it can be assured to the patient that the quality of nursing care is more than before upgrade. Therefore, the purpose of this study was to determine the relationship between the quality of nursing care and the satisfaction of pregnant mothers from the implementation of the health system development plan. The present study is an analytical cross-sectional study conducted in 2017 on hospitalized mothers and nurses working in the maternity sections of Al-Hadi Hospital in Shoushtar city. Based on the study by Mousavi et al., according to formula (d = 0.06, P = 0.03, α = 0.05) the number of mothers admitted in the delivery wards was 198, and considering the probability of a 10% drop, the sample size of 220 mothers was estimated. Finally, 163 mothers were hospitalized in cesarean delivery and mothers (normal delivery) of Al-Hadi Hospital in Shoushtar, through census and target sampling during the 3 months (from September 2017 to November 2017). The nurses working in the aforementioned sections were census based on 25 people. The number of those who participated in the study was about 18 in the study because of the reluctance of 7 of them to participate in the study. Inclusion criteria for mothers admitted to maternity sections included reading literacy, informed consent for participation in studying, and receiving health-related services in at least two shift work periods. Furthermore, inclusion criteria for nurses including minimum clinical history 1 year before the implementation of the Health System Reform Plan, informed consent for participation in the study and having a bachelor's or master's degree. The exclusion criteria in both groups were the failure to complete the questionnaire completely. The data gathering tool in this study was a demographic information form, the Nursing Care Quality Standard Questionnaire (QUALPAC) and a researcher-made questionnaire for assessing the satisfaction of pregnant mothers in maternity sections. The demographic form for hospitalized mothers (age, occupation, level of education, type of hospitalization, economic status, and type of insurance) and for nurses also included (age, level of education, work experience, marital status, and type of job shift) in the study. The standard questionnaire for nursing care quality (QUALPAC) assessment has 51 items. The questionnaire consists of three dimensions as follows: personal-social dimension (10 questions), psychosocial dimension (28 questions), and communication dimension (13 questions). The scoring method in this questionnaire is based on a 3-point Likert scale (rarely: 1; sometimes: 2; and most often: 3). The total score of care for the total number of questions obtained is 123, which is accordingly classified into three undesirable categories (1–42), desirable (42–83), and very desirable (83–123). The validity of the questionnaire was assessed by faculty members of Semnan University of Medical Sciences, Iran, and its reliability was 0.81 based on Cronbach's Alpha. The researcher-made questionnaire on the satisfaction of mothers admitted to the Healthcare Reform Plan has several areas that include the admission process, the length of hospital admission, the discharge process, the unofficial payment of fees and doctors, and the overall patient experience in the hospital. The method of scoring questions is based on the Likert scale of three options (complete satisfaction: 1; relative satisfaction: 2; and dissatisfaction: 3). The overall score of the questionnaire is 81–27. A score of between 45 and 27 means dissatisfaction, a score between 63 and 45 indicates a relative satisfaction, and a score between 81 and 63 indicates a complete satisfaction. Due to the lack of a standard questionnaire for measuring the satisfaction of hospitalized mothers from the implementation of the health promotion plan, this questionnaire was designed as a researcher-made, adapted from the guideline of the Health System Development Plan by two experienced experts in this field. A questionnaire was designed to determine the validity of 10 faculty members involved in the study to be considered. To determine the reliability, the internal consistency determination method was used. The questionnaire was delivered to ten mothers who were eager to study and then excluded from the study. Finally, its reliability was obtained by calculating Grenoble's alpha of 0.91. To observe ethical standards, the researcher visited the maternity section of Al-Hadi Hospital in Shoushtar with the consent of the research deputy of Shoushtar faculty of medical Science and with the consent of the research department. Then, while introducing the self and expressing the purpose of the research, with informed written consent, the questionnaires were distributed to the mothers during the discharge (in the morning shift) and in the middle of the shifts, to the qualified and satisfied nurses to participate in the research. In this way, the researcher provided them with a questionnaire for the hospitalized mothers in their private environment (inpatient room) and nurses' questionnaires at the nursing station to complete them. Furthermore, if there were any questions or problems regarding the questionnaire questions, the researcher did the necessary steps to resolve the ambiguity. Normality of data was analyzed using the Kolmogorov–Smirnov test, which showed that the data did not have normal distribution. After collecting the data, data were analyzed using descriptive statistics (central indexes and dispersion including mean and standard deviation) and inferential tests such as the Mann–Whitney test and Pearson's correlation coefficient in SPSS version 16 software (SPSS Ins. Released 2007 SPSS for Windows, Version 160, Chicago). The statistical significance level was <0.05. In this study, the mean age of nurses working in maternity sections was 32 ± 5 years, 66.6% (12 people) were married and 83.4% (15 people) had undergraduate degrees. The average work experience of nurses was 6.5 ± 3.6. 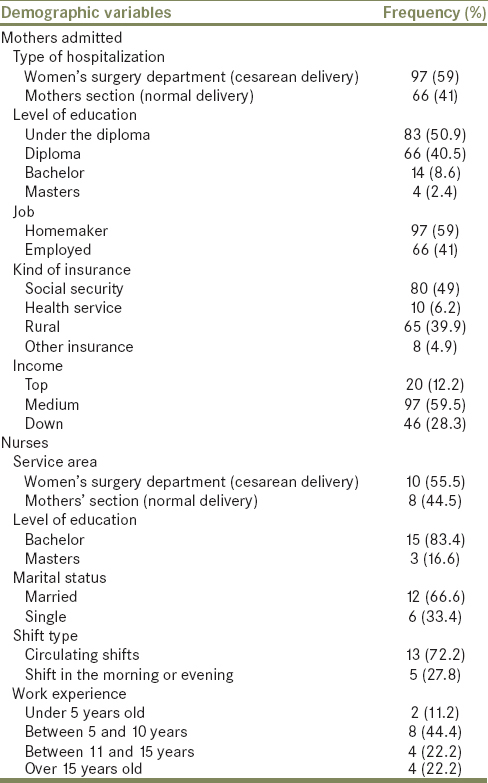 The mean age of mothers admitted in maternity sections was 29.07 ± 7.22 years, and 50.9% of them (83 people) had diploma education and 49% (80 people) had social insurance [Table 1]. The results of nursing care quality assessment showed that the average score of nursing care was 59.5 ± 13.05. Of these, 23% of the quality of care was highly desirable, 63% were favorable, and 14% were undesirable. Furthermore, the results of nursing care quality areas showed that the quality of care was psychosocial (70.8% at optimal level) and in communication (68.2% at optimal level). Comparison of the quality of nursing care in the hospital section showed that the mean of care quality was significantly different in different parts (P = 0.001) [Table 2]. The results of the mother's satisfaction in maternity sections showed that the mean score of satisfaction from the implementation of health-care reform was 85.21 ± 77.77. In this regard, 19.3% (32 people) were dissatisfied, 56.3% (94 people) had a satisfactory level of satisfaction, and 24.6% (41 people) were satisfied with the implementation of the Health System Reform Plan. The health system development plan based on the Mann–Whitney test in the hospital section also showed that there was no meaningful relationship between hospital scanner satisfaction in mothers (normal delivery) and women's surgical sections (cesarean section delivery) (P = 0.928). There was no statistically significant relationship between age, education, income status, occupation, type of insurance, and hospitalization with satisfaction regarding the demographic variables related to mothers (P > 0.05). In addition, the results of Pearson's correlation test showed that there is a significant relationship between the quality of nursing care and patient satisfaction (P = 0.001, r = 0.64). This study showed that 56.3% of hospital scanners in maternity sections of Al-Hadi Hospital of Shuoshtar were relatively satisfied with the implementation of the Health System Reform Plan. Studies by Shariati et al. and Goudarzian et al. showed that 57.5% and 50.2% of patients were relatively satisfied with the implementation of this project, which indicates that this is consistent with the present study. It should be acknowledged that mothers' satisfaction with nursing care can be considered as an important and robust source for assessing the quality of nurses' desirable services. In the present study, there was no significant difference between mother's satisfaction in two parts of mothers (normal delivery) and women's surgery (delivery or cesarean section). Similarly, regarding the evaluation of the demographic variables of the hospitalized mothers, it was found that there was no significant relationship between age, level of education, type of delivery, and type of insurance with satisfaction with the implementation of this project, which is consistent with Shariati et al. Study Joolaei et al. suggested that there was a significant and statistically significant difference between the level of education and the degree of satisfaction; the reason for this inconsistency with the present study can be explained by the fact that people with educational levels they have higher social connections and more access to information resources. For this reason, they see better deficiencies and often less satisfaction. In the field of nursing satisfaction, nursing care quality in the present study revealed that the majority of nurses had a satisfactory satisfaction with the implementation of this project in the field of nursing care quality in two aspects of psychomotor and communication. This is consistent with studies by Neishabory et al. However, in the Safavi et al. study, the quality of nursing care provided by nurses was unsatisfactory from the supervisors' point of view. Concerning the comparison between the quality of nursing care between the two parts of the mothers (normal delivery) and women's surgery (delivery of cesarean section), the results showed a statistically significant difference. Hence, satisfaction with the quality of care in the women's surgery department (delivery of cesarean section) was higher than that of mothers (normal delivery). This may be due to the fact that nurses in the women's surgical department had less stress and workload than shades of mothers. Regarding the relationship between demographic variables and the quality of nursing care, there was a significant relationship between work experience and nursing care quality, so that older people had a higher quality of nursing care, which could be due to the experience gained during the service of people with a history. In this study, there was a significant positive correlation between the quality of nursing care and the satisfaction of the scar in the sections of the delivery. Hence, increasing the quality of nursing care has been accompanied by the satisfaction of individuals with the implementation of the development plan. This factor is in the same direction by studying Gholjeh et al. The limitations of this research can be the high workload of nurses and the crowdedness of the hospital when the questionnaires were completed by nurses and mothers admitted to the maternity sections. This issue has been outside the discretion of the researcher. Given the importance of the quality of nursing care and the satisfaction of clients from the implementation of the health promotion plan, it is suggested that these variables be reviewed periodically. In general, the quality of nursing care from the nurses' point of view and the degree of satisfaction of the scar in the wards of the delivery sector were moderate in implementing the health system reform plan. Despite the measures taken, it seems that patient satisfaction with the implementation of this project is still not satisfactory, which requires more attention from authorities. This study was funded by Shoushtar Faculty of Medical Sciences. The author would like to thank the deputy of the Shoushtar School of Medical Sciences. We also thank the staff at Al-Hadi Shoushtar Hospital and the dear pregnant mothers who participated in this study. Piroozi B, Mohamadi Bolban Abad A, Moradi G. Assessing health system responsiveness after the implementation of health system reform: A case study of Sanandaj, 2014-2015. Iran J Epidemiol 2016;11:1-9. Mehrolhassani M, Najafi B, Yazdi Feyzabadi V, Abolhallaje M, Ramezanian M, Dehnavieh R, et al. A review of the health financing policies towards universal health coverage in Iran. Iran J Epidemiol 2017;12:74-84. Piroozi B, Moradi G, Nouri B, Mohamadi Bolbanabad A, Safari H. Catastrophic health expenditure after the implementation of health sector evolution plan: A case study in the West of Iran. Int J Health Policy Manag 2016;5:417-23. Shariati A, Jamshidbeigi Y, Baraz Pardnjati S, Haghighizadeh M, Abbasi M. Assessment of nurses, patient satisfaction, patient attendants in educational hospitals in Ahvaz city health development plan in 2015. J Clin Nurs Midwifery 2017;6:9-18. Piroozi B, Moradi G, Esmail Nasab N, Ghasri H, Farshadi S, Farhadifar F. Evaluating the effect of health sector evolution plan on cesarean rate and the average costs paid by mothers: A case study in Kurdistan province between 2013-2015. J Hayat 2016;22:245-54. Ghasem Zadeh Z, Sajadi HS, Sajadi FS, Aghili G, Hadi M. The comparison of selected statistical indicators of a hospital before and after the implementation of health reform plan: Isfahan-2015. J Health Field 2017;4:9-16. Majidi A, Mahmoodi S, Adineh VH. An epidemiologic study of emergency department visits before and after executing health sector evolution plan; a brief report. Iran J Emerg Med 2016;4:130-4. Moradi-Lakeh M, Vosoogh-Moghaddam A. Health sector evolution plan in Iran; equity and sustainability concerns. Int J Health Policy Manag 2015;4:637-40. Sarkhanlou F, Saeedi M, Janbabai G, Nikfar S, Morteza-Semnani K, Zaboli P. Comparative study of direct patient and drug costs before and after the implication of healthcare reform program in Sari, Iran. J Mazandaran Univ Med Sci 2016;26:228-32. Nabilou B, Salem Safi P, Yusefzadeh H. Performance assessment of health system reform plan in the hospitals affiliated with Urmai University of medical sciences. J Urmia Nurs Midwifery Fac 2017;14:896-905. Hashemi B, Baratloo A, Forouzafar MM, Motamedi M, Tarkhorani M. Patient satisfaction before and after executing health sector evolution plan. Iran J Emerg Med 2015;2:127-33. Mousavi J, Mohaddesi H, Farhad N, Fathi AA. Evaluating satisfaction level among in-patients about the health system evolution program in affiliated hospitals of Urmia University of medical sciences. J Urmia Nurs Midwifery Fac 2016;14:601-10. Goudarzian AH, Sharif Nia H, Jafari H, Jamali S, Badiee M, Sayemi Z, et al. Inpatient satisfaction with health system transformation project in Mazandaran educational hospitals, Iran. J Mazandaran Univ Med Sci 2016;26:190-5. Hashemi N, Farhani Nezhad S, Faghih A, Imani E, Fatemeh N, Kashani S. Evaluation of inpatient satisfaction from the implementation of the health system evolution program (HSEP). J Prev Med 2017;4:32-9. Parker WA, Steyn NP, Levitt NS, Lombard CJ. Health promotion services for patients having non-comminicable diseases: Feedback from patients and health care providers in Cape Town, South Africa. BMC Public Health 2012;12:503. Ebrahimnia M, Ameriun A, Azizabadi Farahani M. Satisfaction rate of hospitalized patients in military hospitals from presented services. J Mil Med 2010;12:101-5. Torkzahrani S, Khazaiyan S, Shykhan Z, Akbarzadeh A. Assessment of mothers satisfaction of health care provider's performance in postpartum ward of selected Zahedan hospitals. Adv Nurs Midwifery 2010;20:11-9. Rostampey Z, Khakbazan Z, Golestan B. The effect of trained female relative on active phase length during labor among low risk pregnancies (In Persian). J Med Fac Guilan Univ Med Sci 2010;19:79-85. Omidi M, Hosseini M, Maher A. Analysis on satisfaction of mothers from the healthcare reformation plan after childbirth. Hakim Health Syst Res 2017;20:149-55. Izumi S, Baggs JG, Knafl KA. Quality nursing care for hospitalized patients with advanced illness: Concept development. Res Nurs Health 2010;33:299-315. Zarea K, Negarandeh R, Dehghan-Nayeri N, Rezaei-Adaryani M. Nursing staff shortages and job satisfaction in Iran: Issues and challenges. Nurs Health Sci 2009;11:326-31. Joolaee S, Hajibabaee F, Jafar Jalal E, Bahrani N. Assessment of Patient Satisfaction from Nursing Care in Hospitals of Iran University of Medical Sciences. Hayat 2011;17:35-44. Ijeoma E, Ada N, Peace I. Helpless patients' satisfaction with quality of nursing care in Federal tertiary hospitals, Enugu, Southeast, Nigeria. Int J Nurs Midwifery 2011;3:6-13. Keifi S, Shahriari M, Baghersad Z, Sheibani-Tehrani D, Rejalian F. Effects of patient education program on the quality of nursing care and inpatient satisfaction in surgical wards of selected hospitals in Isfahan, Iran. Hosp Pract Res 2016;1:129-34. Gholjeh M, Dastoorpour M, Ghasemi A. The relationship between nursing care quality and patients satisfaction among hospitals affiliated to Zahedan University of medical sciences in 2014. Jorjani Biomed J 2015;3:68-81. Aiken LH, Sermeus W, Van den Heede K, Sloane DM, Busse R, McKee M, et al. Patient safety, satisfaction, and quality of hospital care: Cross sectional surveys of nurses and patients in 12 countries in Europe and the United States. BMJ 2012;344:e1717. Neishabory M, Raeisdana N, Ghorbani R, Sadeghi T. Nurses' and patients' viewpoints regarding quality of nursing care in the teaching hospitals of Semnan University of medical sciences, 2009. Koomesh 2011;12:134-43. Mohaddesi H, Behroozi T, Saeigharenaz M, Sahebazzaman Z, Gholamy M. Evaluation of the maternals satisfation in the delivery ward from health services provided in Urmia Motahari hospital in 2011. J Urmia Nurs Midwifery Fac 2015;13:358-66. Bonilla-Chacín ME, Aburto NA. The Mexican Social Protection System in Health. Washington, DC: World Bank; 2013. Safavi M, Abdollahi SM, Salmani Mood M, Rahimh H, Nasirizadeh M. Relationship between nurses' quality performance and their job satisfaction. Q J Nurs Manage 2017;6:53-61.